This is what I’ve been working on the past few weeks. Digitizing these ancient dusty records, scanning the jackets, and photographing the liner notes, for this hulking mass of worldly beauty collected Alan Lomax. 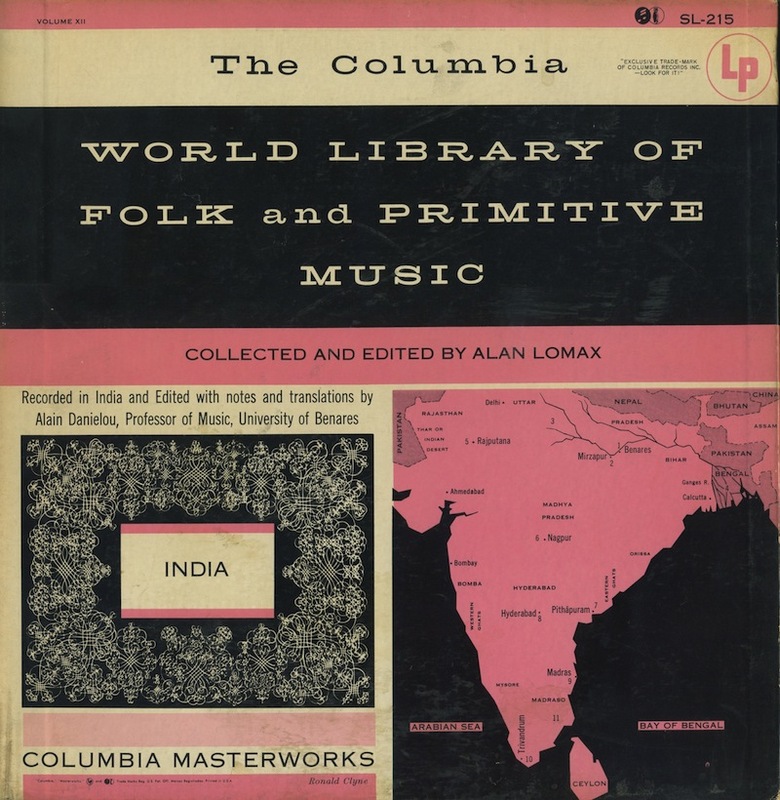 The Columbia World Library Of Folk & Primitive Music series goes well into the double digits (some details here), but these are the 7 best. My favorite place ever The Record Exchange gave me first dibs on this sweet bunch, so naturally I grabbed the ones from French Africa, Indonesia (New Guinea, Bali, Borneo, etc), Venezuela, British East Africa, India, Bulgaria, and Japan (also includes The Ryukyus, Formosa, And Korea). There’s so much to dive in to, each record has insane diversity just in itself, and these are literally all over the map. 100% awesome, no filler. Lots of surprises & treasures. The music will speak for itself, but I have a lot of technical stuff I’d like to share as well. The vinyl isn’t always in the best shape. Considering their age, they’re immaculate, but there’s still over half a century’s worth of grit caked in the grooves. I did my damnedest to clean ’em and ended up only having one spot that wouldn’t play through. The second piece on the third band on side B of the Bulgaria record couldn’t play without skipping in the same spot every time, so I axed it. Everything else is intact. I didn’t do any digital cleanup for pops n clicks so these V0 mp3s sound as close to my vinyl as you’re gonna get. The ID3 tags are a little weird but that’s because the records are a little weird. Each side has a few tracks/bands, and each track has between 1-10 pieces. I opted to keep the original format, so each mp3 represents one band (except that Bulgaria piece mentioned above, had to split that in two), and is tagged as “1: Song 1 / 2: Song 2” and “1: Artist 1 / 2: Artist 2.” Also, the artists are spottily mentioned in the liner notes, so frequently just the name of the recording location is used in the “Artist” field. But lucky you, I included legible photographs of allll the liner notes. Each record is a gatefold with attached booklets containing lots of photos and details on every song recorded, so my ID3 tags are just a pitiful attempt at capturing that data. The photographs aren’t prefect because I wasn’t sure how many people actually cared about them. So I slacked a bit on the quality, but like I said, they’re all legible. I hope you enjoy these records as much as I do. They’re a bit of a shining gem in my collection and I’m really excited to share them with you. Globetrotting via records is the best way to go. Fantastic. I’m glad you’re helping to keep these alive. Thank you very much for making this available. Excellent initiative ! Thanks a lot for keeping these alive. Thanks a lot for this! I really appreciate this post, couldn’t find the collection anywhere else. Links to vintage ethnic music that aren’t dead! Wow! Thank you soooo much! I downloaded it, but when I extract it, the only file is a DS store file. I always wondered what other recordings A. L. Lloyd had made in Bulgaria in 1954 which weren’t on his Topic Records album issued in 1964. Some of them are the same. However I offer you big thanks for providing the others! I knew about the Columbia record but never thought I would be able to hear its contents until now! Thank you again. Thanks thanks thanks!!! its people like you who makes internet work!! Tried downloading but 700MB+ takes over 4 hours. Maybe it would be better to offer each LP separately? Also clicks and pops can be removed with audacity. Then Save As MP3 (320 kbps) makes for smaller files. Sorry about that, CJB. I didn’t consider someone needing to download smaller files. I don’t have a lot of free time nowadays (haven’t even posted an OOPs post in over 2 years) but if I get around to uploading the individual records, I’ll make an edit here and notify you. Also, a technical note: removing clicks from vinyl rips using the filter in Audacity (or any other app for that matter) always ends up with at least a small loss in the original fidelity unless you painstakingly remove each click manually, or do every single click individually, both of which are incredibly time consuming. I opted for the original sound of my copies over a tidy digital sounding version. Personal preference, of course, but I just wanted to explain why. Hello,do i understand correctly that you have more? I’ve since found a lot more volumes, including Canada. I haven’t had a chance to rip them yet, though. When I do, I’ll be sure to make another post!